Where to turn to for the latest in physics and cosmology? To De Quincey Co’s team of dancers, video, sound and animation artists—and guest scientists—whose two new works, Pure Light and Moths & Mathematics, comprise Metadata. In her own works and those with her company, Tess De Quincey always seems to incline to the metaphysical, even a secular transcendentalism, partly because of the way she undoes our time-space coordinates and our relationships with objects and other bodies. In Metadata, she and Peter Fraser, address science, intuitively and directly. 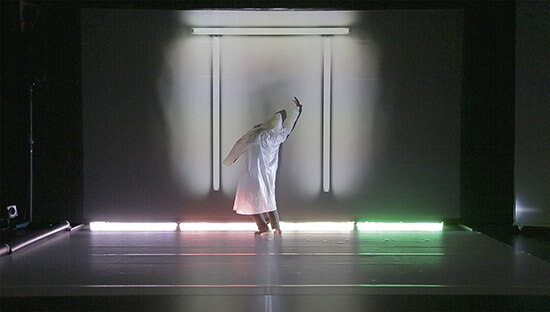 Metadata offers audiences a discussion with a scientist at the end of each performance. In our ‘information culture,’ this simultaneous juxtaposing and partnering of art and the explanatory is an important cultural development. Thanks to the Snowden revelations and the hesitancy of governments to face up to the demands of privacy, “metadata” has accrued negative connotations, but in this De Quincey Co production the title suggests we might gain sight of a bigger picture, whether biological or cosmological—possibly of the same make— in which data is at once meaningful and magical.